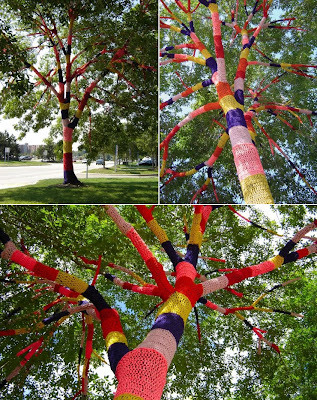 I've just interviewed stiX of Outdoor Knit (aka the red headed devil child's geeky mother) for a story on their work decorating our glorious city with even more glorious knitting and craft. Pretty great. They're the people behind the "It Will All Be Ok" cross stitched into a wire fence on the bypass. This beauty by Carol Hummel. 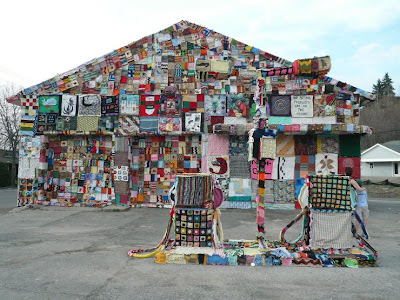 The International Fiber Collaborative beautified an old gas station. 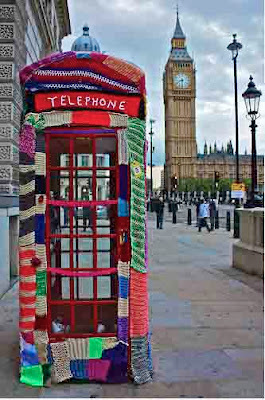 And this beauty is by the Convent Garden guerrillas, pic courtesy of Knit the City and Yarnbombing. Wow, that tree is gorgeous!